Flavor Bell was born September 9, 1917 in Sardis, Mississippi to Caroline and Charlie Hibbler. She married her childhood sweetheart, Otis Hill and from that union, one son, AD, was born. The marriage ended in divorce. She met Leroy Booker in Memphis; they married and moved to Seattle in the late 40s when numerous Southern black people migrated north in search of skilled jobs. Leroy first found employment in the shipyards and later landed a position as a riveter at Boeing, a position he kept until his retirement in 1981. Mrs. Flavor was a lifelong homemaker and the strong matriarch of the family. She was known to say, “I am the boss of this house; I wear the pants,” and no one ever forgot it. She did not have an extensive formal education but she was an expert at budgeting. She handled the family income and expenditures and researched how one goes about purchasing real estate. Unbeknownst to her family, she patiently saved money until one day she announced, much to their surprise, “We’re buying a house.” Her husband and son wondered how. Very few of their associates owned their own homes. So she pulled out a bundle of money to show how much she had saved, how much was for a down payment, how much for insurance, etc. 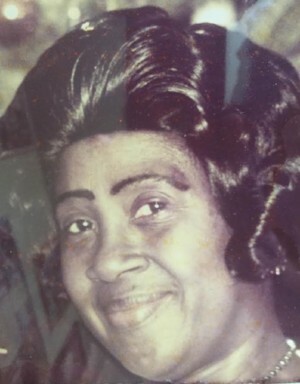 A devoted wife, mother, grandmother, she was known for her culinary skills, especially, said her son, “smothered pork chops and chicken, fried fish, mustard greens, cornbread, and banana pudding.” She was a faithful Christian and a member of Progressive Missionary Baptist Church in Seattle for more than 50 years. She was an active choir member and was particularly proud of being a member of the usher board. She saw to it that her son grew up in the church and that her husband attended at key times. She also liked to dine out at Tai Tung’s in the International District; and at Art Louie’s in Ballard. Flavor and Leroy moved AD and his young family into their home until they could purchase their own house. One grandson, Larry, lived with her while in high school and she saw him through college. When her husband suffered a fall in 1996, she cared for him at home despite the fact that he was paralyzed from the waist down. This was her self-appointed duty until he died in 2000. Her direct descendants (21 in number) include her son, Dr. Anthony D. Hill, formerly AD, six grandchildren, ten great grandchildren, and four great-great grandchildren. The grandchildren are Anthony Duane, Jr., Larry, Andrea, Troy, Kyle, and Alycia. The great grandchildren are Anthony Duane, III, Patrice, Laurence, Chanel, Simone, Neda, Austin, Quinntin, Claytin, and Langstin. The great-great grandchildren are Jaivian, Elias, Cilas, and Athenia. Four siblings, all deceased, were Tyre and Truella of Evanston, Illinois; and Willis and Ernest of Water Valley, Miss. A half-sister, also deceased, was Mary Anna, also of Water Valley. Her daughters-in law, granddaughters-in law, and great-great daughters-in law are Elvina, Dorothy, Naghmeh, Denise, Janie, Eva, Patricia, and Toccara. Devoted caregivers were Mary, Toni, Beverly and Natalia. She is also survived by numerous nieces and nephews, friends, and neighbors. Flavor Bell loved to dress well from shoes to hats. In recent years, up to a few months ago, she enjoyed dancing the salsa and dining with other seniors at El Centro de la Raza Community Center. She was the eldest dancer and had more rhythm than most. Mrs. Flavor’s dancing ceased in this life on Friday night, 2 September at 11:30 p.m. when she quietly passed away with a smile on her face in the home they bought 56 years ago.